Painted this little study in my studio the other night from a reference photo. The view is from the Rubicon Trail looking down onto Lake Tahoe, which in this part of the lake is the deepest near shore. 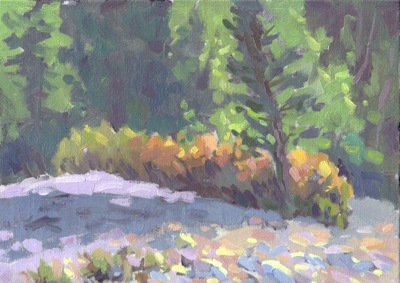 I painted in my usual “full key” (full value range), which allowed me to use rich colors and sharp value contrasts. I set this painting next to my most recent “high key” value painting. It was striking to see the sharp contrast, and you can really see that the photo of the previous painting wasn’t over exposed, but really quite light. Coincidentally, both paintings had trees in them, and when side by side, the curve of the land connects, as if they’re part of the same scene. So which painting gives the best feeling of light? Perhaps that’s an individual choice. I’m still very interested in this technique, so will continue to pursue it.